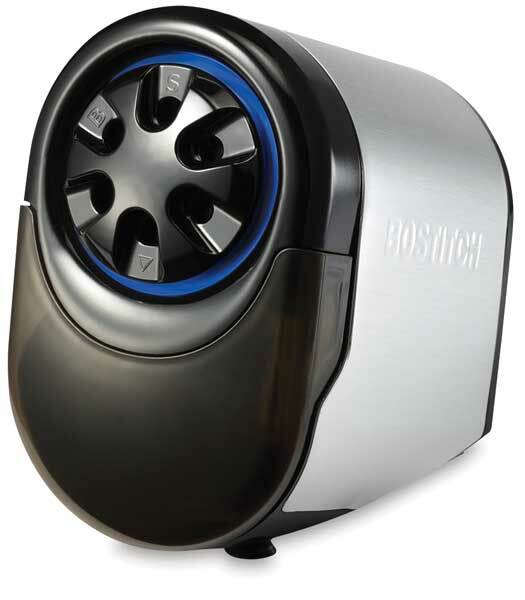 Extend pencil life and cut down on sharpener noise with the QuietSharp Glow Classroom Electric Pencil Sharpener from Bostitch! Equipped with a powerful QuietSharp motor for quiet, stall-free operation, the QuietSharp Glow features a tool-free, removable cutter cartridge for easy cleaning or replacement. Perfect for school settings, this money-saving sharpener with replaceable cutters is compatible with colored pencils and features the XHC cutter for 70% faster sharpening and 10 times longer life. The shavings tray features a tamper-proof MagnaSafe safety switch that shuts down the motor when the high-capacity shavings tray is removed. A blue SharpGlow light around the dial, and SharpStop technology that turns the sharpener off, both let you know when your pencil is sharp. The unique curved shape, sleek brushed-metal case, and anti-microbial protection of the QuietSharp Glow offer class-leading style, durability, and safety. ® Bostitch is a registered trademark.™ QuietSharp, SharpStop, SharpGlow, and MagnaSafe are trademarks.